SCVHistory.com SC9301 | Canyon Country | Begonias Lane Park Grand Opening, 4-24-1993. April 24, 1993 — Grand opening of the 4.6-acre Begonias Lane Park at 14911 Begonias Lane in the Pinetree (Shadow Pines) section of Canyon Country. The city of Santa Clarita inherited a parks deficiency when it incoporated December 15, 1987, and it set out to plug the gap. The Pinetree-Timberlane section was included in the original 90-square-mile plan for the city, and a majority of residents of the area signed cityhood petitions (Boyer 2005:195), but LAFCO carved them out when it whittled down the final city boundaries to 39.5 square miles. On August 25, 1988, just nine months after incorporation, the City Council voted to start the process of annexing the 2.3-square-mile area. The annexation turned controversial as some vocal opponents questioned whether their taxes would go up (they didn't), and the residents of the affected area finally got to decide whether to join the city in the eletion of November 6, 1990 (they did). As one way to provide additional service, in 1991, city park planner and development supervisor Wayne Weber spearheaded the creation of a master plan for an undeveloped park site on Begonias Lane in the newly annexed area. The City Council approved the master plan October 2, 1991, and moved forward with funding that had been earmarked for the new park in the city's 1991-1992 budget. New city park swings into life. The Signal | Sunday, April 25, 1993, pg 1. CANYON COUNTRY — Residents at the east end of town ended their waiting for a park as Begonias Lane Park was officially dedicated Saturday. JoLynn Miller, 10, said the new park — on Begonias Lane near Shadow Pines Boulevard — is the only one in the city close enough for her and nearby friends to walk or bike to on their own. "There's no place to play otherwise, except the street where you skin your knees," she said. Hundreds of children and parents came out to try the playground equipment, shoot basketballs and throw Frisbees provided by the city. Children on the slides, swings, teeter-totters and other equipment were hard-pressed to name their favorite thing about the park. "It's great," said Jennifer Lee, 8, of Canyon Country. "It just has a lot of great things." "There's a lot of toys," said 5-year-old Ashley Baer, as she and several friends dug a hole in the sand beneath a slide at the playground. The park was originally scheduled for completion in January or February, but few said they minded the delay now that the park is open. "It's wonderful," said Keith Pierce, a Canyon Country resident who was at the park with his three children. "It's taken a long time but it's finally here." "We couldn't afford to pay the contractor to build it, but we got a real good deal on the shelter from the supplier," he said. 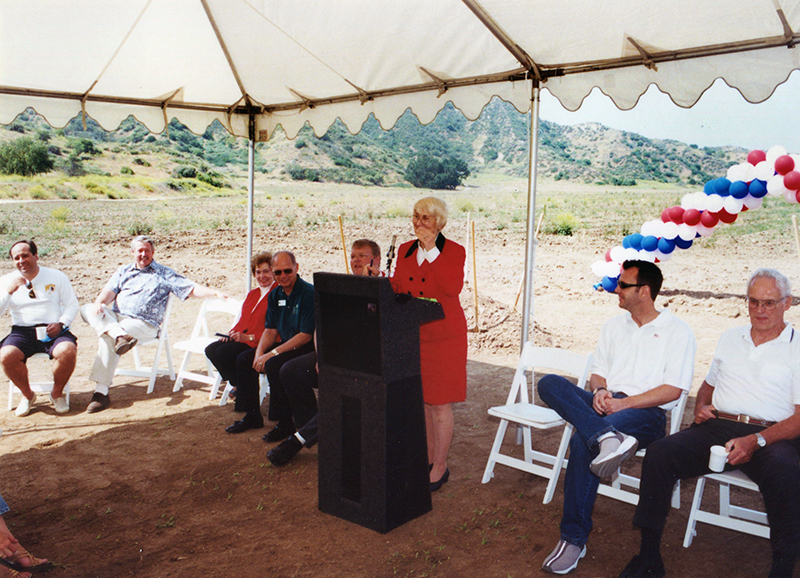 The 4.6-acre park cost the city about $450,000, said Santa Clarita Mayor Jan Heidt. It includes playground equipment, a lighted basketball court, picnic areas, restrains, walking paths and water conservation-oriented irrigation. The floor of the playground equipment is made from recycled tires, officials said. In addition, the entire park is handicapped-accessible. The outside walls of the restrains have been treated with special material to repel graffiti, and a neighborhood watch group has been established to help prevent graffiti and vandalism. Many officials speaking at the ribbon-cutting urged residents to keep a watchful eye on the park. "There are a lot of forces out there that can change this park from something your community can be proud of," said Judy Hein, principal of Pinetree Elementary School. SC9301: Download original scans here. Online only.